Lousy news out of eastern France this week that vandals/thieves broke into Notre Dame du Haut in Ronchamp by smashing the one piece of stained glass signed by Corbusier in the church. A broken and discarded collection box suggests it was no more than a spectacularly ill-intentioned robbery, but the incident and the loss of such an artifact has raised alarm among preservationists. The UK Guardian reports that both William Curtis and Antoine Picon have publicly accused the Association L’Oeuvre de Notre-Dame du Haut of lax security, and more broadly of outright negligence in running the site. Picon is quoted as saying the ““moisture problems, infiltration and poor preservation of masonry” can all be blamed on a lack of maintenance and attention, while Curtis has gone farther, accusing the Association of “treating this universal masterpiece as merchandise” while failing to adequately direct income from visitors toward upkeep. While discouraging and shocking, the lax security is neither surprising nor uncommon in this austerity-stricken part of the world right now. Just last night the dinner discussion at the Academy revolved around the plight of a major Italian museum that has been unable to hire new security guards because of savagely reduced budgets and, simultaneously, ongoing corruption that has kept salaries at outrageous levels. Programs to hire emergency volunteers to ensure that galleries are staffed–at all–during opening hours have apparently been quashed by the unions. Picon and Curtis make the point, though, that Ronchamp isn’t really in this category, and that with upwards of 80,000 ticket-buying visitors each year the Association has had more than adequate resources to secure the site with staff and video surveillance. This puts it squarely in the Pompeii camp; a cultural site that has apparently squandered its financial and cultural legacy on patronage and commercial ventures while its physical fabric crumbles irrevocably. 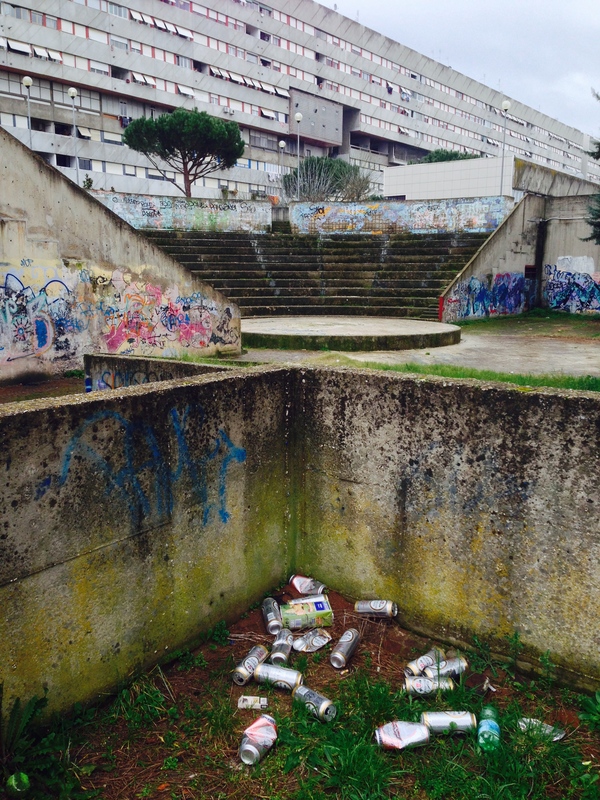 An unsettling morning yesterday, with a guided walk through Corviale, the kilometer-long housing project in southwest Rome that has symbolized the disillusionment with large-scale social housing for a generation. It was built from 1972-1981, and it opened largely without services or public transit from its greenfield site into Rome. Public services intended for a fourth floor sky corridor never materialized, and instead squatters moved in, creating a permanent social rift with official, rent-paying residents. There’s been virtually no maintenance on the structure, and it has the feel of an inhabited, 21st-century ruin. Its failure has been the subject of countless studies, proposals, and even films. You can certainly see what the architect (Mario Fiorentino, who is also known for the incredibly moving Fosse Ardeatine monument) was going for–the scale should have been awe-inspiring, the eight-story atrium a thrilling space (Iowa State folks will recognize the diagram here, surely, since our College is basically a scaled-down version of the same thing). But the provision of designated social spaces, the shoddy detailing, the thoughtless circulation all render the architectural idea irrelevant. Architects who construct fantasies–whether antique or futuristic–forget that people prefer their own stories. My morning routine involves a dose of Paul Krugman’s blog, and the other day he wrote about playing with Google’s ngram feature. This is the metadata part of the Google Books project, which has digitized thousands of volumes and converted them to electronic text. ngram lets you find out the frequency of words across books at given points in time, so you can basically see whether a phrase was trending or not. And, as you can see here, you can compare phrases, too. This gives you a neat little capsule history. Above is a comparison of “welded connection,” “bolted connection,” and “riveted connection.” You can see that rivets (green line) were hot stuff (sorry) up through the mid-1950s, after which interest dropped off. By 2000, they were interesting only to historians. Meanwhile, welding (red) took off in the late 1910s and soon surpassed riveting, which was becoming obsolete as labor costs rose. Bolted connections (blue) slowly grew in popularity as precision and technique were refined, and today they surpassed welding in the late 1970s. Hardly scientific, but not at all inaccurate. And a fantastic time-waster. So, when Routledge suggested a second edition, we were keen to do it. Rob Whitehead, our tech colleague, re-wrote the structures section and put together new diagrams that will be even easier to follow. We’ve included new chapters on digital fabrication, zoning, & super-high rise construction. And (a real coup) Ann Sobiech-Munson has added a chapter on specifications. All in all, it should be more useful, more up-to-date, and good for another seven years or so. Many, many folks to thank, including editors, production folks, and marketing gods at Routledge, but also the students who have dog-eared, marked-up, and post-it-noted copies over the years…the suggestions have all been appreciated and (mostly) incorporated. Bonus points to the first correct identification of the cover…sort of like one of us signing every single copy…. A rare treat this week thanks to Fritz Steiner of UT-Austin, who is here studying Raphael’s Villa Madama. 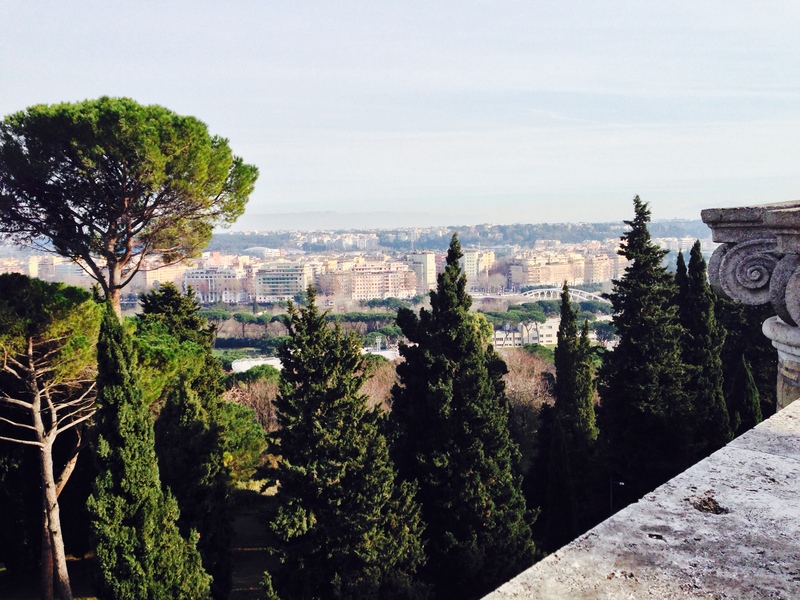 I took him up on an invitation to visit the place, which is one of the toughest sites in Rome to see–the Villa is now owned by the Italian government, which uses it to host foreign dignitaries. So it’s taken Fritz a month to get in, and there were passports and security clearances involved, but we did get up Monte Mario on Tuesday and it was well worth the wait. The Villa is one of Raphael’s rare architectural works–he came to building and landscape design late in his career and managed only a few buildings before his death in 1520 at the age of 37. Of these, only the Villa Madama and the Chigi chapel survive unscathed–and the Villa, begun in 1518, was left an incomplete fragment after Raphael’s death and the sack of Rome in 1527. But–of course–what a fragment. What’s there is just under half of a planned complex that would have focused on a circular, internal courtyard, with an amphitheater extending up the hill and a huge complex of ramped and terraced gardens that would have spilled down toward the Tiber–roughly where Librera’s Fencing Academy building is today. The extant building is the ‘summer’ wing, and the interiors, finished by da Sangallo the younger with Giulio Romano and Baldessare Peruzzi fighting one another over the decorations, are sumptuous. It has been immaculately restored, perhaps in part because of a certain former Prime Minister’s fondness for remote but lavish villas (the cab driver, on the way up the hill: “you know bunga bunga?” Best not to think too much about this). And there’s this amazing helical staircase–unclear whether this is Raphael or da Sangallo, but either way it’s an epic work of stereotomy, and an utterly immersive thing to walk up and down. The gardens, though, are the real treat. They’re laid out as a long, long axis, clearly cut along the side of the hill, with occasional glimpses out to the west of the Flaminia quarter and Ponte Milvio. The siting had a political component, in that you’d be practically forced to pass by the Villa on your way to the Vatican from points north, but it’s also an ingenious use of siting and solar geometry. I won’t give away Fritz’ convincing explanation, but as and when he publishes it, the Villa should gain a reputation as an environmentally responsive design avant la lettre. Ugh. The New York Times reports this morning that after a long “evaluation” process, their architects, Diller, Scofidio, and Renfro, “can’t find a way to save” the 12-year-old American Folk Art Museum by Williams/Tsien. The Folk Art Museum was, to be fair, a quixotic enterprise, but the building they briefly occupied was hands-down one of the best things to happen in New York in the last decade. The facade, a tactilely engaging, brooding presence, contrasted nicely with the MoMA shopping mall down the street, and as the larger museum went even further toward a sort of bland, corporate but tasteful minimalism with its 2004 renovation by Yoshio Taniguchi, the contrast offered by Williams/Tsien’s cast-bronze panels was refreshing. So, as the latest MoMA expansion began to digest more of its block, the alley-wide Folk Art Museum was seen as a likely casualty. The Museum claimed that its narrow spaces wouldn’t allow for the kinds of displays it wanted to put on, but one suspects that the narrow spaces simply wouldn’t accommodate the “throughput” of customers that MoMA continues to draw. And the not-so-subtle riposte offered by the hand-crafted facade of the Folk Art Museum was probably doomed from the start politically, too. Like many “evaluations,” this one had the feel of preservation-washing from the start. We’ve gotten used to hearing po-faced declarations from owners about responsible consideration of preservation issues, only to find months later that a landmark’s destruction was pretty much a foregone conclusion. It’s hard to imagine that a firm known for its alleged world-beating creativity (A MacArthur, for heaven’s sake) is suddenly baffled by narrower-than-average gallery spaces. If that’s really the case, maybe MoMA should bail and host an ideas competition. Losing a genuine bit of civic sculpture to the “customer experience” of an art museum is galling enough. But there are a couple of other issues here that strike me as particularly awful. First is the waste of materials and energy that goes into demolishing a building that’s just twelve years old. In our emphasis on building performance we consistently forget that building itself uses a phenomenal amount of embodied energy. Most buildings won’t come close to paying back their carbon debt over a reasonable lifetime, so to take all of this carbon footprint and literally blast it into the atmosphere after less than half a generation seems gluttonous. Second, when good buildings get torn down, can we at least replace them with something thoughtful? The “Art Bay” bears a remarkable similarity to the Apple Store at your local mall. I like Apple Stores, but I think culture should really flow the other way. Finally, MoMA isn’t just a patron. It has defined and curated modern architecture for the last eighty years. The commercialization of its mission over the last decades has been inevitable–but it has badly diluted the museum’s reputation. The shows I’ve seen there since the renovation have been modestly interesting, but exhibitions like 2010’s “Counter Space,” on kitchen design, have seemed more sponsor-friendly than really investigative or challenging. They’ve always had a reputation for caring more about architectural drawings than about real architecture, and the fate of the Folk Art Museum seems to encapsulate that problem perfectly. You are currently viewing the archives for January, 2014 at architecturefarm.